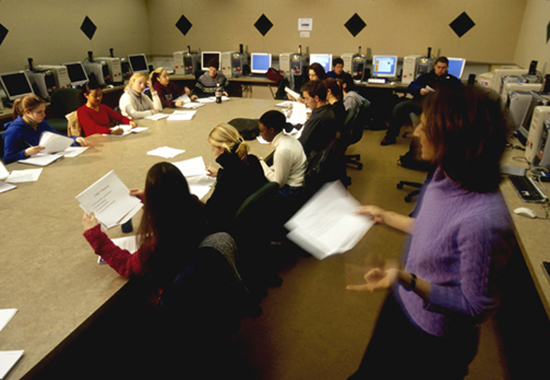 Money from the Wesleyan Campaign helped to fund a variety of initiatives, including new facilities and refurbished facilities like this computer resource center in The Exley Science Center. “I promise you that when you contribute to the Wesleyan Campaign, your gift will produce results and ensure Wesleyan’s legacy for the next generation and generations to come,” he said. His promise is already being fulfilled. Five years and $281 million dollars later, Wesleyan has renovated dozens of classrooms, added 20 new faculty positions across the curriculum, offered 140 additional scholarships and rejuvenated Clark Hall, Memorial Chapel and The Patricelli ’92 Theater and Ring Family Stage with the Zelnick Pavilion connecting the buildings. The Rosenbaum squash center with nine courts and the Andersen Fitness Center have also made a presence on campus. These projects are all made possible through the Wesleyan Campaign, which capped its $250 million goal by $31 million on December 31, 2004. The priorities of the Campaign came directly from the Strategy for Wesleyan and, of the funds raised, $47,160,000 went towards Endowment for Financial Aid; $48,700,000 to the Freeman Asian Scholars Program; $19,900,000 into the Fund for Excellence; $40,300,000 was directed toward Faculty and Academic Programs; $46,100,000 to support new facilities and the Campus Renewal Fund; $57,000,000 into the Wesleyan Annual Fund. An additional $21,800,000 pledged is currently undesignated. Because of generous gifts to support financial aid, students are borrowing on average $8,000 less over their four years at Wesleyan. A record-setting 68 percent of alumni participated in the campaign, along with 3,472 parents, 219 corporations and foundations and more than half of the senior faculty. This was Wesleyan’s second official campaign drive, built on the foundation of the Campaign for Liberal Learning, which raised $67 million by 1987. In 1995, a firm advised Wesleyan to set a $100 million goal for the Wesleyan Campaign. Wesleyan continued to set the bar higher. They decided to aim for a quarter of a billion dollars, a number that appealed to John Woodhouse ’53, chair of the Wesleyan Campaign. Although the campaign is over, University Relations is building on the momentum of the campaign to focus on the Wesleyan Annual Fund, further increasing the endowment for financial aid and emerging facility priorities, including support for the Usdan University Center and a new Life Sciences building. A “Thank You” in sound and photos from President Bennet on behalf of Wesleyan can be viewed at http://www.wesleyan.edu/campaign/thankyou/.